It was almost end of my journey as the fellowship of the ring. I had to throw away the ring to the crater that meant my job finished. I forgot about looking for the ring but suddenly the ring was just inside my pocket. I didn't aware..it might be someone ,who i didn't know, put the ring inside my pocket secretly. At least, i enjoyed my trip with no worry. 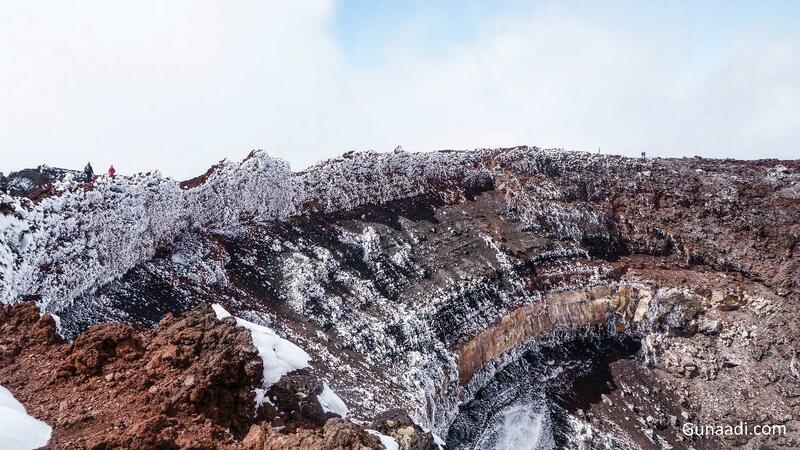 Tongariro crossing is the oldest national park and the best one-day trekking (19.4 km long) in New Zealand. The diversity of the track make it more dramatic to be experienced. The colorful and sparkling lake, the summit, hot spring, forest and savanna will accompany you along the way. Mt Ngauruhoe is part of Tongariro Crossing that used to represent Mt Doom in lord of the Ring Movie. 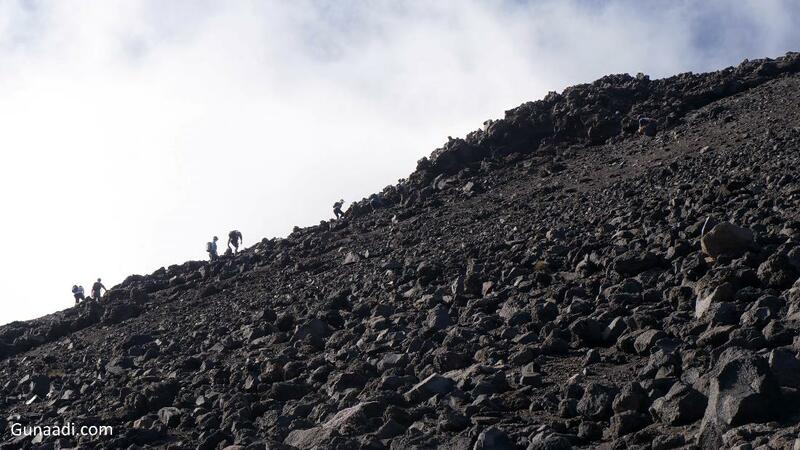 The summit is 3 hours return hiking and quite difficult to reach it but you most probably can do it! 16:30 - 02:00 (Next day) : Being a homeless again for 9 hours! until bus to Auckland arrived but with more haunted experience! 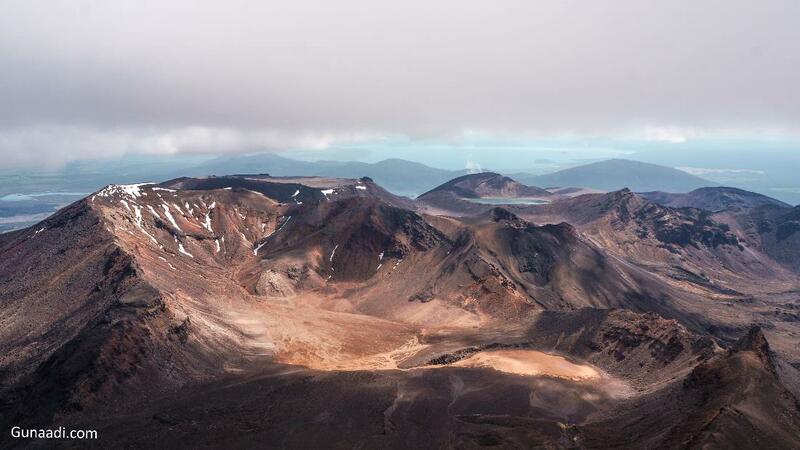 Most people take shuttle bus to Tongariro from Turangi, Taupo, Ketetahi or Base camp. 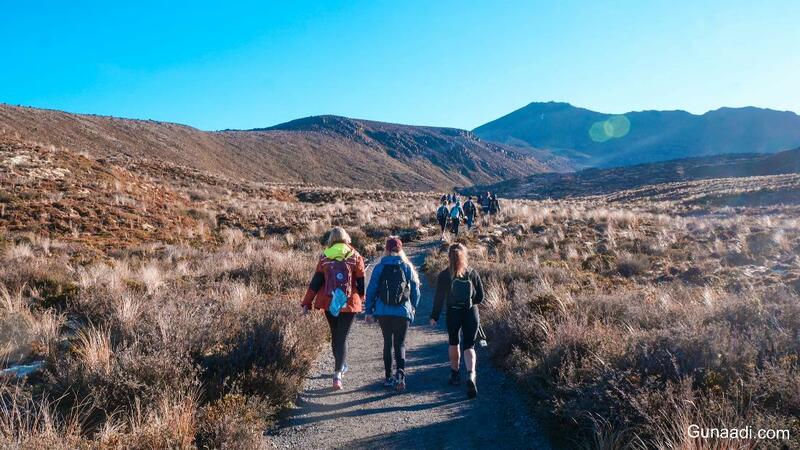 Walking is the only way to explore Tongariro. Car is only able to drive until the car park. please note that this is one way trekking so there are 2 difference car park for start and end. Alternatively, you may return after finished your trekking but it waste your time. My accommodation in Turangi was a Bus stop or literally i was a homeless for 2 night. A simple bus stop with only 2 meters length and 1 meter wide covered by tin roof. Just like that ! I couldn't complain about Kitchen, wifi or Toilet anymore! I Arrived in Turangi at 2 AM and waited another bus to Tongariro early in the morning, 6 AM, then came back again to Turangi in the Afternoon, 5 PM. it is not the end! after that, i had to wait another bus from Turangi to Auckland. The bad news was the bus departed at 2 AM from Turangi. my schedule was very tight, wasn't it? I considered to not book any accommodation or just being a homeless. Seriously, i slept at the bus stop and it was only me! lucky, there was free toilet nearby! 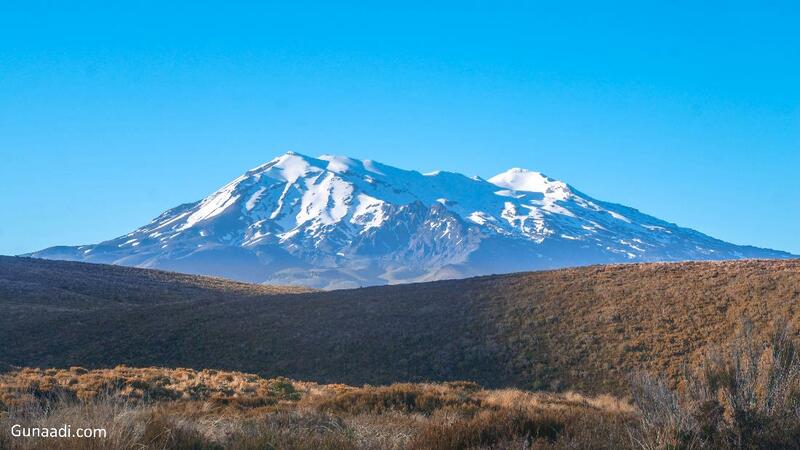 Most of shuttle bus departed from Turangi, Taupo, Ketetahi or base camp around tongariro. there are many shuttle bus provider started from those place. 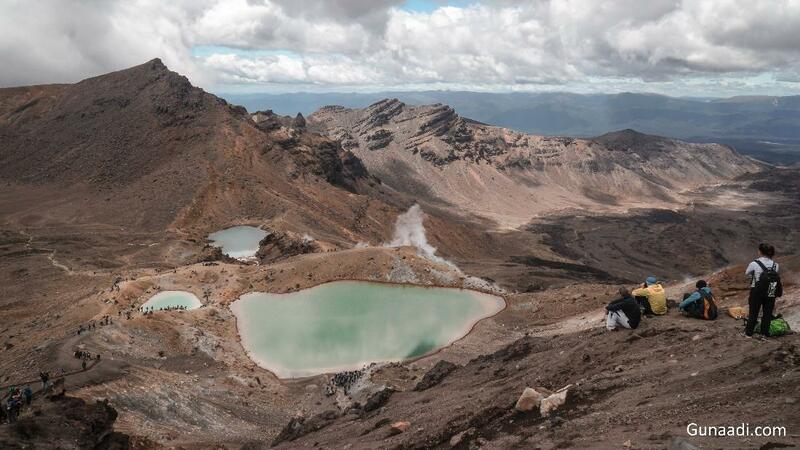 Tongariro is the oldest national park and the best one-day Trekking in New Zealand. 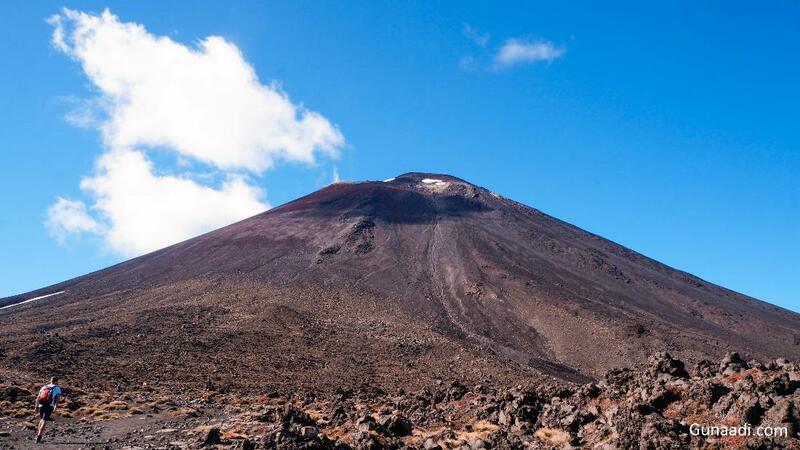 It is 19.4 km long track and estimated 5 hours trekking or 8 hours trekking including Mt Ngauruhoe Summit. The diversity of the track make it more dramatic to be experienced. The colorful and sparkling lake, the summit, hot spring, forest and savanna will accompany you along the way. The journey will be steep and the weather unpredictable. The difficulties is above average but i believe you can do that. It is only one-day trekking so you may not bring a lot of stuff. Stamina is needed so better you have to sleep well night before and get usual with long walking. No need to plan to much because you will get a map and brochure with complete information about the track, duration and emergency call number. There are a lot of people there so you will not get lost. The summit is the worst and most difficult part so you may take it or leave it but it is worth to take it. Tongariro Crossing is one way trekking so starting point (called Mangatepopo Car park) and pick up point (Ketetahi car park) is difference. The shuttle bus will wait you at pick up point after you are finished. Most important thing that you shall know is the time when your shuttle bus departing back from tongariro to your respective place. Usually, the shuttle bus leaving between 3 PM - 5 PM. Just make sure with the bus provider before you start the trekking. If you are missed or you want to skip (maybe you want to stay longer in Tongariro) the bus, you have to call the bus provider. If you do not inform the bus provider, you will be considered as a lost person. The emergency team will look for you if you are really lost. If not, they will fine you with much money. This country concern with safety very much. I crossed the Mangatepopo valley in my first kilometer of my trekking. It was looked like rocky grass field for me but the land was a harsh place for plant to live. Only specific plant could live there. It believed that Mangatepopo Valley was glacially carved out during the last ice age and partially in-filled by lava flow from Ngauruhoe. The Mt Ngauruhoe could be seen from here and another mount called Mt Ruapehu. There was a toilet after i walked for a hour. After the toilet, there was intersection. left way would brought me to Soda Spring and right way was a way to the South crater. I thought why not to visit the Soda spring because later on the track will connected to the same direction. Arrived there, it was only a small water fall that the water contains dissolved mineral from the volcanic. The bad news was water can not be drunk. I Continued from Soda Spring to South crater. From South Crater, i could see the Mt Ngauruhoe aka Mt doom clearly. 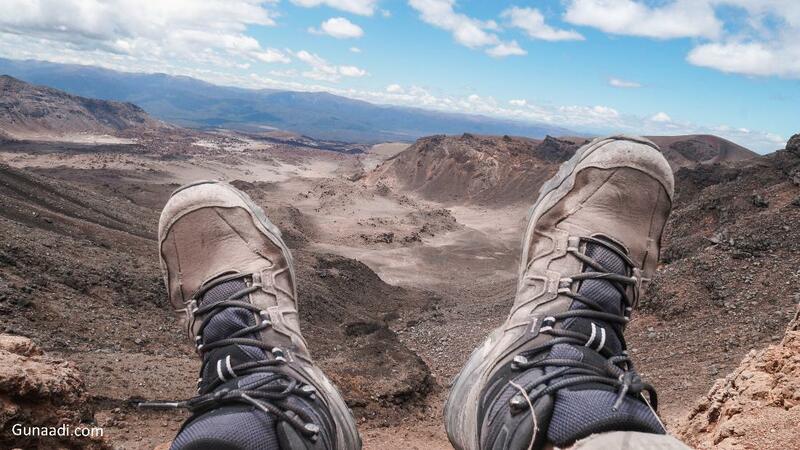 Taking Mt Ngauruhoe Summit would take 2-3 hours more of my time. For me, it was the main reason why i was here so i took the challenge. The inclination was very bad so it made me making several stop along the way. The path was not so stable especially when there were a lot of small rocks. It made me sliding down so i needed to choose the correct steps. Sometimes, bigger rock felt down to me. Actually, i could use any track available because the summit was clearly up there. However, i preferred to use the path that people usually used. After arriving on the summit, i could see amazing scenery. 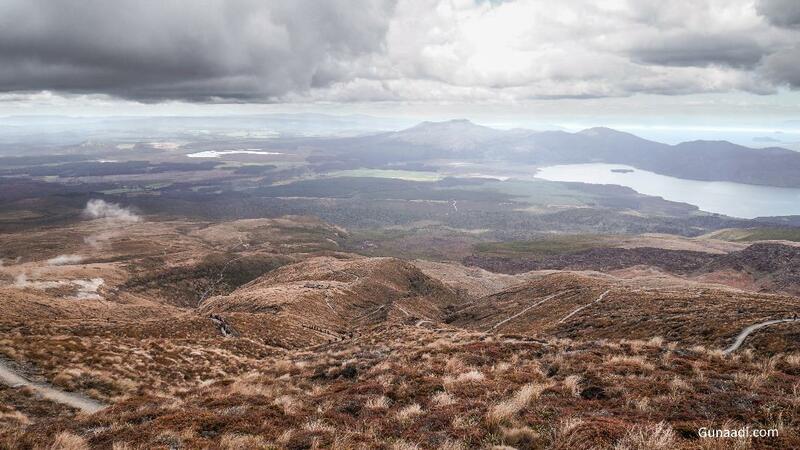 I saw the whole part of Tongariro crossing with 360 degree view. Some part of the crater was still covered by ice. It was very cold up there. It might be below zero degree. The proud being there was priceless. I was ready to throw the ring. My job had been finished then. Tongariro is an active volcanic mountain. There are Several craters like Mt Ngaruruhoe crater, red crater and Te maari crater. most of all are still active! From the peak of red crater, i saw lakes with a very vivid colour. I was curious about it so i preferred to continue. It was called Emerald lakes located northern edge of Red Crater. In Maori language, it was named Ngarotopouname meaning greenstone-hued lakes. There were 3 crater filled by water contained minerals like Sulphur. It is the reason why the colour so vivid. I couldn't drink or even swim because it was acid water. No worry, i still had a lot waters in my bag. Walking for another 30 minutes, i passed another lake called Blue Lake. It is a fresh water lake with up to 16 metres deep. The lake is sacred. People said to not swim in or eat food around the lake. Finally, the track would be stepped down. I could saw the grass now and Taupo lake from far far away. It was so beautiful there but the weather was quite cloudy. It could be better when sunny. at my right side, there was the active crater Temaari. The crater was blowing the gas from his belly. Some hot spring was also available there but private own. It is the last part of the trekking, a forest. Some part of the forest is suggested to walk faster because of the magma will probably flow on that area (wow, seriously, that was just written like that). I kept walking faster on most of the part because needed to catch the shuttle bus. I didn't want to miss it and then had to stay in the forest. Finally, i arrived at 4 PM in the Ketetahi car park. The Shuttle bus just dropped me back in Turangi around 5 PM. I still had 9 hours to be spent until my next bus. The first thing i do was sleeping on the grass until 8 PM and night had not came yet. Then, i moved to burger king for looking a wifi until 11 PM because the restaurant closed at that time. I moved to the bus stop and considered to walk around the town for killing my time. My haunted night was started. The town was very silent at the midnight. i couldn't find any people around me. I just walked around to the town center. I felt warmer there rather than in the bus stop so i tried to wait or maybe sleepthere. Suddenly, i heard something fall down, slammed door and uncommon human voice! I ran away! I ran to gas station because bus stop was also very silent and had a chit chat with the truck driver who knew about pencak silat, one of Indonesian martial art.